St. John’s had its start in the 1870’s when the present Wisconsin Rapids area was first settled. At that time there were two settlements, Centralia and Grand Rapids, on opposite banks of the Wisconsin River. In 1875, the Rezin and the Albee families organized a mission and gathered donations of $225, forwarding the money to the Endowment Fund of the new Diocese of Fond du Lac, thus insuring the mission’s inclusion in that diocese. In 1876, Bishop Brown, first Bishop of Fond du Lac, visited Grand Rapids, baptizing and celebrating the Holy Eucharist. The following year the Bishop returned and organized the mission officially, dedicating it to God in honor of St. John the Evangelist. In 1879, the first church edifice was erected. It was written up in the Centrailia Enterprise on March 6, 1879. ”Our Episcopal friends have let the contract for the erection of their new Church building in Centralia to Mr. Decereau, for the sum of $1,500.00. The work is to begin by May 1st, and to be completed by October 1st. We wish them abundant success.” The first church building was located on the northwest corner of Third Avenue North and McKinley Street. By 1880 there were 90 members and a service was held every Sunday. The 1880’s were trying times, marked by tornado damage to the church and lack of regular visits by a mission priest. The next 35 years were troubled. Fourteen mission priests served the parish. During the years of 1890 to 1925 membership did not grow. The first Rector was Father James Madison Johnson, who came to serve St. John’s in 1925 and stayed nineteen years. During this time there was steady growth, and it was decided that a new church building was needed. The community of Wisconsin Rapids showed support by contributing more funds than the members of the parish. The construction was hastened because a fire destroyed the old church edifice. The new church building, which is still in use, was built in the English Perpendicular Gothic design. Its beauty is enhanced by the unity of its interior furnishings. Carved in oak by the Florentine artist Giovanni Massini are the Stations of the Cross, the Rood, statues of St. John, and Our Lady of Mercy, and our Lord with children. The windows are Bohemian glass, the only similar ones in the midwest being in the University of Chicago’s Rockefeller Chapel. The brilliance and deep colors, especially the blue, draw the worshiper’s eyes to the windows and their depiction of sacred history. The building was consecrated, debt free, in 1931. In 1941, the members of St. John’s rejoiced in its growth from mission to parish status. During World War II, St. John’s chapel was given over to the community as a 24-hours a day shrine of prayer. Father Johnson retired in 1944. Father Beauford L. Marceil was called a Rector, and served faithfully for 28 years. Those years saw great growth. New membership highs were attained. The Sunday School flourished. An antique sale became an event of great popularity. A new parish hall was built, as was a new rectory. For his great accomplishments, Father Marceil was named Rector Emeritus upon his retirement in 1972, serving as same until his death in 1982. Father Marceil was succeeded by Father Lawrence Boyd. Fr. Boyd oversaw the restoration of the magnificent windows. He prophetically summoned the parish to meet the challenges and storms in Church and Society of the 1970’s. Father Boyd accepted a call to another parish in 1978, and was succeeded in 1979 by Fr. J. Lewis Warren, PhD. Fr. Warren’s rectorate was marked by growth in Christian Education for adults, and revision of the Church School curriculum. Christian stewardship was strengthened. Fr. Warren instituted community outreach programs such as contributions to the local Food Pantry, the use of parish facilities for community activities, and sponsorship of children through the Christian Children’s Fund. The lawns around the church were landscaped; a garden and a columbarium were added. The parish hall and church were insulated and other measures were taken for energy conservation and economy. Fr. Warren left in December of 1982. The fifth rector was Father D. J. Dunlap, who assumed duties on Palm Sunday, 1983. The parish entered into a program of evaluation and planning of its ministry. In order to meet the needs of those that had impairment of movement a new handicap entrance was built and a bathroom equipped for special needs was added to the main level of the Parish Hall. A stage, storage area and choir robe closet was built in the parish hall. In 1994 the Kimball organ that had originally been given to the church by Mrs. Charolette Gibson Witter was in need of extensive repair. Parts were no longer available to do the proper rebuilding of the organ. Fr. Dunlap was instrumental along with an organ committee and the vestry to negotiate for a new tracker organ. A representative of the Walker Organ Company of England came and presented a proposal to the committee and vestry. It was accepted and a fund raising campaign began. The organ was shipped through Canada and arrived here by truck. The Walker Organ Company builders assembled the organ in four weeks. At the organ dedication Bishop Jacobus stated that it was to be shared with the community. We have done so by hosting several organ recitals, the last being in the fall of 2011 when one of our organists, Will Louis-Brux performed various music, some of which were his own compositions. Fr. Dunlap served St. John’s for fourteen years. The next rector was Fr. Kenneth E. Hunter. The church began a new curriculum for Vacation Bible School, outreach programs were offered to the parish and community. He served as the president of our local clergy association, served on two Diocesan boards, and belonged to the local Rotary. Under Fr. Hunter’s leadership a parking lot and a vestibule into the parish hall were constructed. Fr. Hunter served for five years. St. John’s next rector, was The Rev. Vicki J. Natzke. As a child, Pastor Vicki was baptized and confirmed at St. John’s and moved from Wisconsin Rapids in the late 1960’s. Pastor Vicki was involved in many community organizations. She, along with several other Pastors in the Wisconsin Rapids area, was instrumental in developing a mentoring program called “Life Changes”, to help County jail inmates re-enter society by helping them to find housing and employment. She also served on many committees in the Episcopal Diocese of Fond du Lac, is currently serving a Dean of the Wisconsin River Deanery, and as Monarch Cursillo Spiritual Director. She began her duties on Palm Sunday, 2004 and retired on December 31, 2017. Pastor Vicki served St. John’s for thirteen years. St. John’s recently completed it’s search process for a new rector. Fr. David Klutterman has accepted the call to St. John’s, and will officially begin on January 1st, 2019. Fr. Klutterman has been a member of the Diocese of Fond du Lac since 1969, and a Priest of the diocese since 1980. He has a BA from U of W Green Bay and is a 1980 graduate of General Theological Seminary, New York. In 1980, he served as assistant to the Rev’d Roger Wharton who was vicar of the yoked congregations of St Matthias, Minocqua and St Mary of the Snows in Eagle River, which was then called the Northwoods Missions. In 1981, when the two congregations split, he became vicar of St Matthias, serving from 1981-1984. In 1984 he accepted a call to be Pastor of St James, Manitowoc and also served as Hospice Chaplain for local groups, and helped coordinate ecumenical affairs in community. He served St. James from 1984 – 1996. In 1996, he accepted a call to St. John’s, Wausau. Over the course of 22+ years in this role, the congregation grew, and was financially healthy. He was involved in ecumenical work through the downtown churches group and also NAOMI. He also volunteered his services with WIPPS. 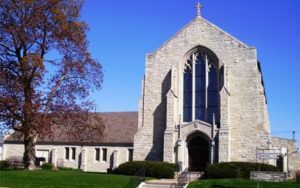 He also served as permanent supply for St. James Episcopal Church, in Mosinee, from 2009 -2017, serving as a bridge until they found their own clergy. He is married to Marilyn, has three adult children, three grandchildren with another on the way. He retired from full time ministry in February of 2018. He will serve St. John’s as Priest-in-Charge. In 2003, Ginny Steen, a member of St. John’s, with the support of the priest at that time, Fr. Ken Hunter and the Revs Paul and Wanda Veldman of the First Congregational/UCC Church, the United Methodist Church, First English Lutheran Church and other interested community leaders joined together to start a feeding program called The Neighborhood Table. The congregation of St. John’s hosted The Neighborhood Table (TNT), an independent 501(c)(3) organization for it’s first 11 years. The first meal was served on December 31, 2003. TNT began with two meals a month and since then has grown to be a large community and ecumenical project, feeding over 400 meals (including carry-outs) on every Thursday and the last two Tuesday’s of each month. Due to the increased use of the kitchen, Grants through the Community Foundation of South Wood County and The Episcopal Church’s United Thank Offering were written and approved to help financially with remodeling and improvements to the facility . Construction began in the summer of 2005 and was completed in the late fall. On January 1, 2015, the Neighborhood Table moved from St. John’s to the United Methodist Church, 441 Garfield St. and continues to serve meals on the last 2 Tuesdays of the month and every Thursday. Also during the spring of 2005, the church began an extensive restoration project. The stained glass windows were removed by Conrad Schmitt Studios and were completely restored. The church walls were repaired and repainted and the floor refinished. The windows were in place by Advent, 2005. The columbarium also was increased to a total of 42 niches.